It’s hard to believe we are entering the season of MAP testing and that end of year activities are just around the corner! MAP stands for Measures of Academic Progress, and BAIS administers the MAP tests twice a year; once in early September and once in April. There are four tests available, and BAIS has chosen to administer three. The students next week will take tests in mathematics, reading, and language usage. One exception is Kindergarten and 1st grade who will only take two tests: mathematics and reading. Testing next week will be on Tuesday, Wednesday, and Thursday from 7:45am-9:00am. Students will then begin first period at 9:00 and have regularly scheduled classes for the rest of the day. Kindergarten and 1st grade testing will be on Tuesday and Wednesday only because they do not take the language usage test. In order for students to do their absolute best, it will be important for them to get a really good night’s rest. For optimum health, teenagers need at least 9 hours of sleep in order to be fully rested. Younger children need a little bit more sleep to perform optimally. For elementary students, try to have your child sleep at least 10 hours. Students should eat a large, balanced breakfast before coming to school. In the secondary school, in order to support our students achieve their best, teachers will be assigning minimal homework next week. Advanced Placement courses will continue to have homework because the culminating exam is a few weeks away. Other than those courses, students should have less homework than usual. When parents receive results in May, keep in mind the focus of the results should not be the norm referenced percentile. The focus should be the growth the student has demonstrated from September to April. Our target is for every student to meet their RIT goal for each test. In order for that to happen, students need to do their best, be well rested, and come to school having eaten a healthy breakfast. I look forward to seeing the excellent results! Do you want to measure your science skills? Do you want to know what you can work on as a scientist? Here is an opportunity for you to do just that! 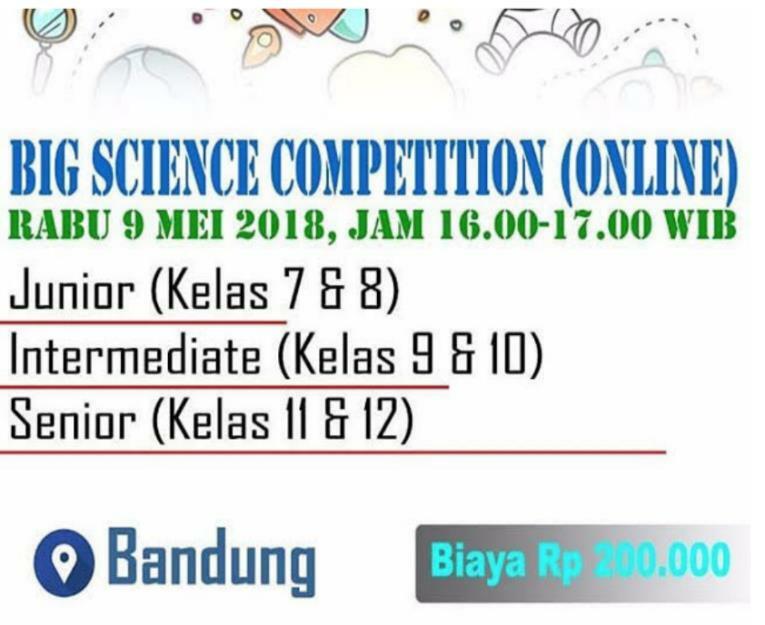 The Big Science Competition is out of Australia and allows you to answer questions which test your ability to analyze and evaluate scientific information. It’s an online test and will be hosted at BAIS and will be given from 4-5pm on Wednesday the 9th of May. If you are interested or if you want more information, talk with Ms. Harsono or Ms. Dickman. For those who would like to register, you can email to Ms. Harsono your data: name, DOB, grade, parents email, parents phone number, and address. You will need to pay the registration to Ms. Harsono also. 12:00 PM — Secondary students makeup, hair, and costume call. 1:00 PM — Elementary students makeup, hair, and costume call. 2:00 PM — Dress Rehearsal Performance begins. 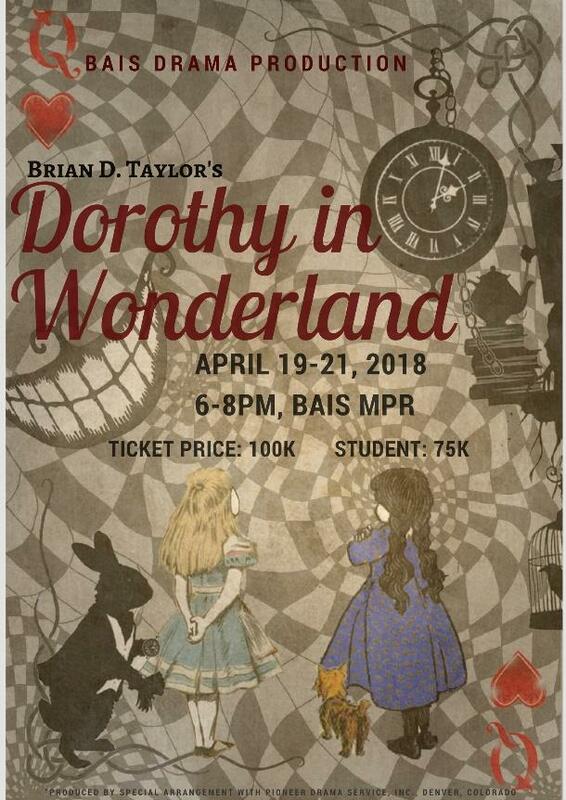 Tickets for the 2018 BAIS production of Dorothy in Wonderland are on sale before school and after school under the blue covering and in the front office. There are only 100 seats available each night. So buy your tickets early! Please feel free to bring flowers and cards as a sign of congratulations for the cast members performances during Dorothy in Wonderland; however, please do not bring a bouquet with any type of lily, especially Easter lilies, because Ms. LaMertha is asthmatic and highly allergic to lilies. I’m truly sorry for this inconvenience. Today during the weekly Counselor/Chaplin Time, Ms. Hall shared about the choices students and parents need to make about the classes they can take in high school. Distinguished Diploma – going beyond the normal number of credits in four specific areas of studies. APID – Advanced Placement International Diploma candidate at graduation. Eagle Living – Recognition at graduation for a certain number of volunteered hours earned while in high school. There will be an evening parent meeting coming up in early May where all parents of 8th through 11th grade will be invited to learn more about the classes that will be offered next year. Assist the director by providing local input and advice. Commit to supporting the Director in being successful in accomplishing the mission and vision of the school. Communicate with the Home Office in the event there is an issue that cannot be resolved locally. This important group of people are crucial to the success of the school. The DAC meets monthly with the director to review the finances, discuss upcoming policy changes, and make suggestions based on the feedback from their respective communities. This is not a policy making board, but one of the important points of input when we are creating and or implementing policy. IISSAC Badminton will be April 27-29th at Wesley in Malang. The final IISSAC payment is due Friday, April 20th. Money can be transferred or cash paid directly to Mr. Powers or Ibu Dias. Preparations for IISSAC Swim are underway! Volunteers will be needed! If you are able and willing, please contact Mr. Powers or Ibu Dias. If you are interested in purchasing a sponsorship banner, please contact Mr. Powers or Mr. Thomas. We are looking for an assistant coach for the Battle of the Books (BOB) team for next school year. BOB is a fun, book-based reading trivia competition played between teams for 3-5 students. The coach would be expected to help prepare required materials (questions from the books, etc. ), attend and help lead the one-hour weekly practice after school, and help run the final competition here at BAIS in November. Please contact Miss Ribbens (clarissaribbens@baisedu.org) if you’re interested! 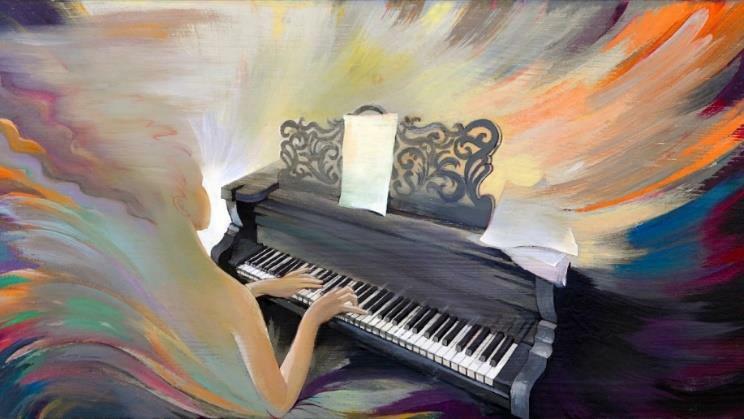 Thank you to all the amazing students and parents that performed at the Music Department’s Spring Concert last Friday! Impressive job Miss Kim! Thank you to all the volunteers that came out to the BAIS Swim Invitational last Saturday! A specific shout out to the student volunteers that came to help! Beltra Chandean, Kyla Victoria, Karen Lee, Chloe Tantowi, HaMin Noh, DJ Lee, Kevin Ko, Sergio Limandibhratha, GyeongMin Kwon. Please contact Mt. Powers or Ibu Dias if you are interested in being a timer for the swim meet. Today our Young Tigers will compete in a soccer invitational at CBCS after school! BAIS sent home invoices for the 2018-2019 school year today with your students. Please ask your child for the invoice if they have not given it to you. If you did not receive one, please inform the BAIS Finance team right away so we can get another one out to you. Just a reminder that the first opportunity to take advantage of the Early Bird discount is coming up soon. The due date for the 5% Early Bird discount is April 27, 2018. Please submit your payment on or before April 27, 2018 to take advantage of the discount. Please do not hesitate to contact the BAIS finance team at finance@baisedu.org should you have any questions.